Fry your own egg - Brilliant concept or bad judgement call? I had a breakfast meeting at the Holiday Inn Eindhoven a few days ago, and as one would expect at a 4-star hotel, it was a regular buffet breakfast with the usual foods on offer. As I looked around the breakfast room, I noticed a predominance of business people dressed in suits (few ties nowadays, but suits nonetheless), and about 30% of them having meetings over their morning croissants. As usual, I started with a plate of fruits and some bread with a regular coffee and some grapefruit juice. There's something about the bitterness of grapefruit juice that just gives me that wake-up kick I need in the morning. For my second round, I went to get some warm food, so I headed to the egg station. To my surprise, there was a battered old frying plate, a bowl of eggs (labelled 'Raw Eggs'), a bowl of egg shells, a (industrial) spatula, a brush with oil and a small salt & pepper set. I was expected to fry my own egg. Really. The picture shows this intricate arrangement of the items. Now I'm not saying that I'm incapable of frying my own egg, or even that I don't enjoy it. But did I expect to at a 4-star hotel? No. So why did they decide to do this, and is it a good idea? Here's what I think. I'll give Holiday Inn the benefit of the doubt, and say that they are probably trying to jump on the 'experience' bandwagon. Having their guests interact with the product more, might give them a stronger emotional bond with it, allows them to have their product personalised, and then eventually come back for more... or that's the idea. It's either that, or they are trying to save on labour costs. Now I can see this working in a different type of hotel. Perhaps a leisure hotel in a relaxed setting where you have all the time in the world. 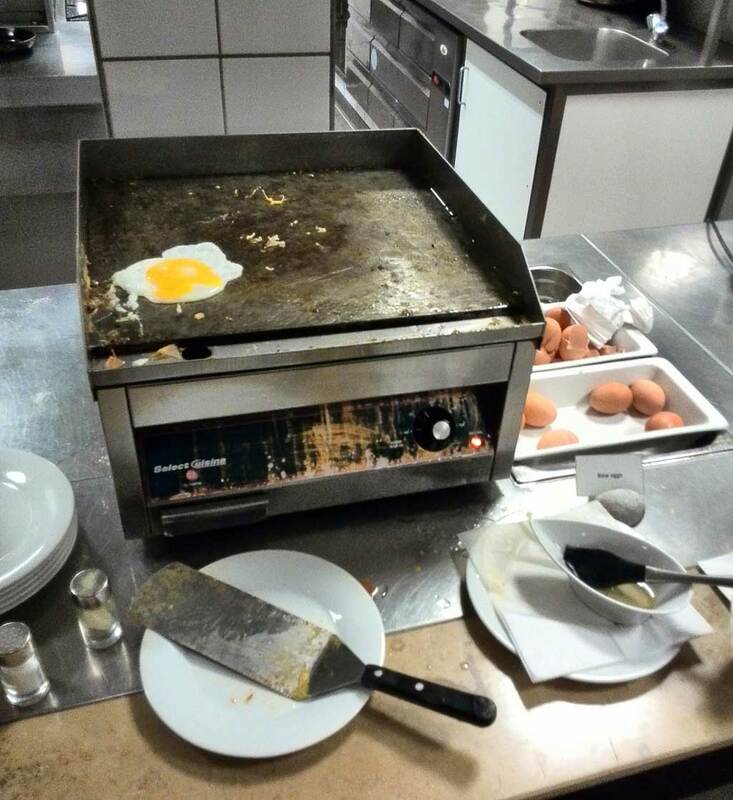 I can see the frying plate being designed in such a way that it fits neatly into the inviting decor of the breakfast buffet. Perhaps a few bowls of spices and herbs that you can use to season your egg, and maybe a sign "Feel free to fry your own egg, so it can be exactly the way you like it." I can even imagine small shapes you can use to make interesting eggs for the kids or loved ones. But in a business hotel? I don't think so. Most of your guests are wearing suits, and are off to a meeting. None of them want oil stains on their shirts. Many of these guests are having meetings at the tables. Do they really want to stand behind the egg station for 10 minutes? Half of them wouldn't even want to touch the spatula, because that's already covered in oil. And there are no napkins or cloths around to get the inevitable raw egg off your hands. So come on Holiday Inn, I advise you to re-think your idea here, and maybe ask your guests what they want.